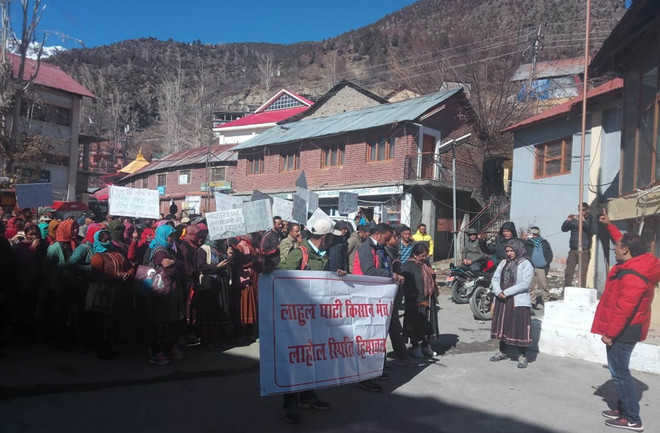 Lahaul-Spiti farmers under the banner of “Lahaul Ghati Kisan Manch” held a protest against the state government at Keylong on Thursday. Untimely snowfall on September 22 and 23 had damaged their crops and vegetables. Since then, they have been demanding a relief package from the state government. They raised slogans against the government, demanding damages. The farmers said due to natural calamities, their lives had become miserable. Many villages have been without power since September 23 as the Himachal Pradesh State Electricity Board has failed to rectify the fault in the lines. Telephone cables too have been damaged. Sudershan Jaspa, convener of the manch, said due to the apathy of the state government, the farmers were under stress as they had lost their crops and had no idea how to make ends meet. “The people are waiting for the relief package. The power supply has not been restored even after 45 days,” he added. “Earlier, the Central Government had banned the sale of Himachali potato seeds out of the state, saying it was affected with some disease, but later the ban was lifted after the state government proved that it was nit infected,” Jaspa said. “We urge the state government to make arrangements for marketing potato seeds at its own level or provide a relief package as per the market value of the potato produce to the farmers,” he added. The manch submitted a memorandum to the tehsildar. Despite severe cold, a large number of farmers arrived at Keylong to join the rally.